How do you balance leading a "normal" life and being a professional athlete and filmer? 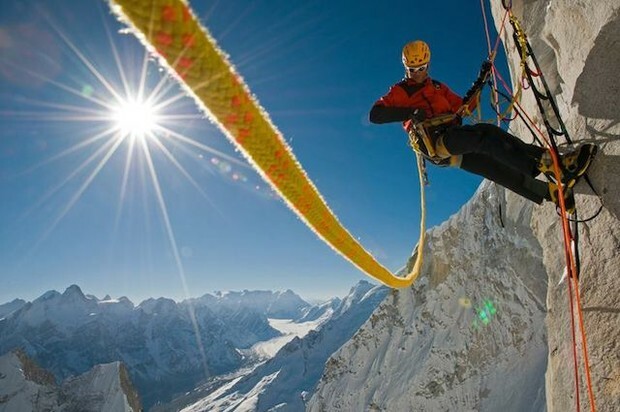 According to Jimmy Chin, "I do much better up here [on Meru] than down on line at the DMV." After two grueling attempts, one successful summit, and an equally challenging descent, Jimmy Chin had yet to face his biggest challenge...making the movie. Although Jimmy cut his teeth with Nat Geo, the North Face, and even commercial brands like Timex, nothing could prepare him for the standard set by Chai Vasarhelyi; the award winning documentarian and Meru co director. We sat down with Jimmy Chin to try and get a better handle on the who, what, where, when, how and most importantly, why they set their sites on Meru, quite likely the most impassable peak in all of climbing. This is the third (find first here and the second here) of a three part series of excerpts from our interview about both the climb and the subsequent award winning documentary, Meru. Hillary/TGR: Do you think this quote from Jon Krakauer, “If you don’t do this you’ll go crazy” is accurate? 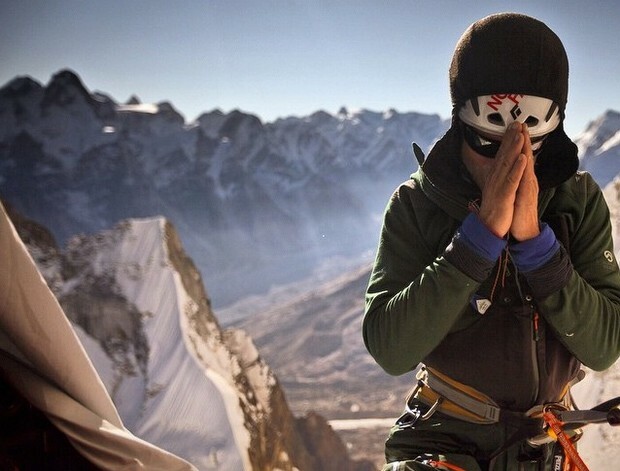 Conrad Anker praying for safe passage. Jiimmy Chin photo via Facebook. It’s kind of like me being in New York. I love New York for about 7 days, but if I don’t get my time in the mountain or in the ocean, then I don’t think anyone wants to be around me. I need it. I don’t see a therapist. This is my therapist. And I just get so much out of it. It’s so beautiful. You move through the mountains in a number of capacities. You’re climbing, skiing, mountaineering. Do you think going into filming with a multisport background and the expressed purpose of capturing a mountain experience gives you a different story telling perspective? Conrad Anker belaying Jimmy Chin during their summit push. Jimmy is leading the second to last pitch of the climb. The pitch included mixed snow and rock climbing up to A3. The team turned around at this pitch during their attempt in 2008. Jimmy Chin/Meru photo. I definitely think having so much experience in multiple disciplines helps me move through the mountains with a lot of knowledge that I can apply in any given situation. Ultimately it comes down to gaining a certain level of comfort. Which is important, because for filming, you only have so much bandwidth in the mountains. If you’re really fatigued or really scared, or somewhere that you’re unfamiliar with, that amount of stress just negates any possibility of having the bandwidth to shoot. It’s really about building a certain threshold level...a high threshold level of comfort in the mountains, so that I can actually think about shooting and I can anticipate moments – thinking about story, thinking about cinematography. That’s been really important in my career. I’ve gotten to travel with a lot of world-class athletes in all these different disciplines with a range of experience, which is really great. That’s the coolest thing. You spend time with so many different athletes in the mountains and you’re always learning from them. Being a photographer and cinematographer I’ve gotten to see all of these different world-class athletes perform and work. And I’ve learned a lot. And then working with world class athletes is really cool because it becomes this team effort. It’s really a symbiotic relationship. And you know, some of my favorite athletes to work with are involved in the creative process as much as I am, and they are putting in just as much effort producing and setting up the shots that I am. So, you’re compelled to tell the story of Meru. Bringing the extra equipment and getting the shot, that’s another risk in addition to an incredibly risky climb. Was summiting equally important as sharing that story? Renan Ozturk bringing up the rear after cleaning the gear on one of Jimmy Chin’s leads. Jimmy Chin/Meru photo. That’s a really great question. I would say filming and shooting has evolved in parallel with my climbing and my skiing. It’s not like I would ever go on an expedition and not shoot. It’s just part of what I do. In a way I see them as one in the same because they have formed together. My first expedition to Pakistan in 1999 I shot and every expedition since I have been shooting and filming. Expeditions and filming and shooting really go hand in hand and deeply intertwined for me. 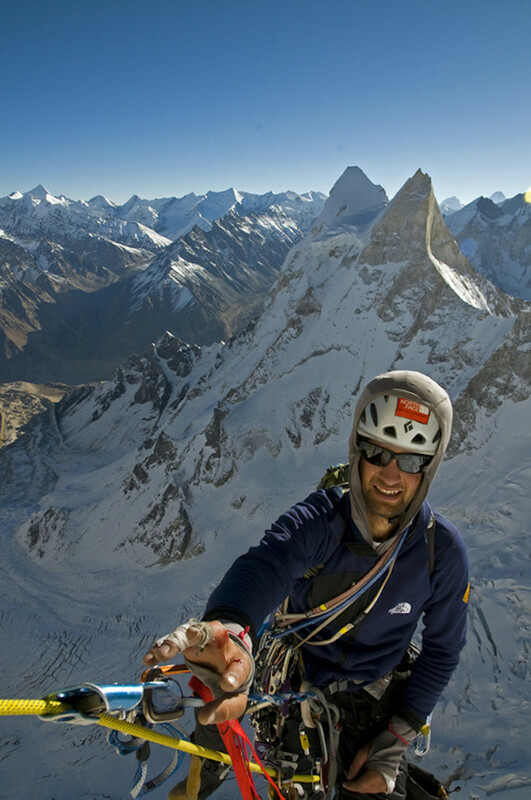 Meru was really the perfect objective because it was kind of the culmination of both my climbing and filming careers. It was one of the most challenging things I’ve ever had to film and it was certainly the most challenging thing I’ve ever climbed. What was interesting though was that making the film was one of the most challenging creative endeavors I’ve ever done. Really, why is that? "Climbing with your mentors is a dangerous thing sometimes, because you give them all your trust. I gave them everything..."Mentor and friend Conrad Anker feeling the weight of that trust on the Fin. Jimmy Chin photo via Facebook. Because making a documentary and telling a story really well and getting a film to say what you really want to say is actually really hard. I mean, I used to think I knew what I was doing. It was so funny, you know I’ve obviously been filming for a long time. But this process was on such another level, and that was because I was working with Chai. She’s an award winning documentary filmmaker. And the documentary film world is like the hyper-intellectuals of the film world. I mean, from the editors to the directors, they are just on a totally different level. They are the literature of film, like the nonfiction part. I mean, the level that everyone was working and thinking on was a huge learning experience for me. I thought I knew where the bar was. I brought the film to New York, left Camp4, and was just really blown away at the level we were working on. Like I said, I thought I knew where the bar was, and I was like “Oh okay, the bar is waaaay up there” So that was hugely exciting and motivating and it really pushed me as a filmmaker. Chai Vasarhelyi and Jimmy Chin, co directors and husband and wife. MeruFilm.com photo. It was amazing. Because of a) the people she brought on board, and b) she’s been making documentary films for fifteen years. Her first film, A Normal Life, when she was 22, won the Tribeca Film Festival for Best Documentary, and her mentor was Mike Nichols. And you should get that recorded because Mike Nichols (Closer, The Graduate, The Birdcage), until last year, was one of the greatest living American directors of all time, and that was her mentor. She worked with him for a year on Closer. She just worked with some of the best people in the industry, so she brought all of these incredible people to the table and then we all went to work together. I think it's because it was this combination of such totally disparate pieces. We were from such different worlds, and when you can take things from totally different places and get them to actually work together, I mean that’s what made the film. In the outdoor world, I don’t normally work with someone like Chai and Chai doesn’t usually work with someone like me. So that was really incredible, and our editor Bob Eisenhower, it was the three of us. We spent a year and a half together, re-shooting, re-editing, re-writing, and we put this thing together. We completely deconstructed it and re built it. Do you think that you will continue to go on these expeditions, ones like Meru, now that you’re a husband and a father? Would you do Meru today? Conrad rappelling from the summit after 11 days of climbing. JImmy Chin/Meru photo. I don’t know, that’s been hard to say. I still have a lot of drive to be in the mountains and do what I love. But I don’t need to go to the most remote places in the world, like I can go to Yosemite and have an amazing time. I can go climb and ski in the Tetons and have an amazing time. I’ve been through the process enough times, and I’ve learned a ton, but who knows. You never know when you’re going to be inspired again to do something like that, and I will never say never.